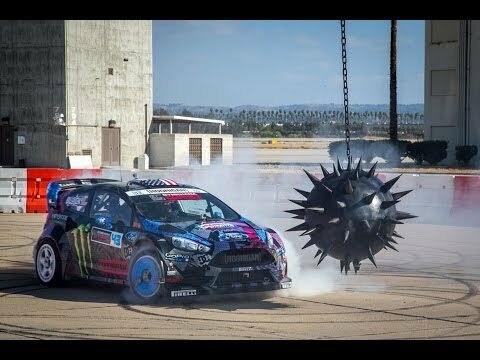 Need for Speed and Ken Block present: Gymkhana SIX: The Ultimate Gymkhana Grid Course. Need For Speed's Racing Advisor Ken Block built the ultimate Gymkhana GRID course -- a real-life playground to showcase the sheer speed, fun and exhilarating action of driving. This means all-new obstacles that help raise the difficulty for Block to master in his Ford Fiesta ST RX43 2013 racecar, including maneuvering around a moving wrecking ball and sliding through narrow opening cut into the sides of shipping containers. Block also added videogame elements from Need for Speed Rivals. Watch as he executes multiple jumps, drifts around Lamborghini Aventadors and evades the videogame-themed Redview County cops on Segways in his own unique style. You can almost smell the burn of the rubber as he tears up this incredible course. So sit back and enjoy the ride.